In my previous article we learnt how to move an application container across CDBs. As we already know, Multitenant Application Containers eliminate the overhead of replicating application definitions by enabling many PDBs to share application objects such as code, metadata, and data. Multitenant Application Containers also allow application administrators to efficiently manage many application PDBs as one in a single Application Container while securely isolating their individual customer-specific data. These valuable features of Multitenant Application Containers can be leveraged for existing applications running in more than one PDB by migrating such applications to an application container. Clone an existing PDB as an application root. Relocate an existing PDB as an application root. Unplug and plug in an existing PDB as an application root. The newly created application root contains all of the database users / objects used by the application. Install an application in the application root and associate the database objects, users, roles, and profiles with the application by running procedures in the DBMS_PDB package. Create application PDBs in the new application container using the existing PDBs. Now, I will demonstrate the migration of multiple PDBs running the same application to an application container by means of a sample scenario. In order to avoid replication of the application objects, we will create an application container sales_app_root which stores various common application objects for the sales application (sales_app) as shown in Fig. 2. 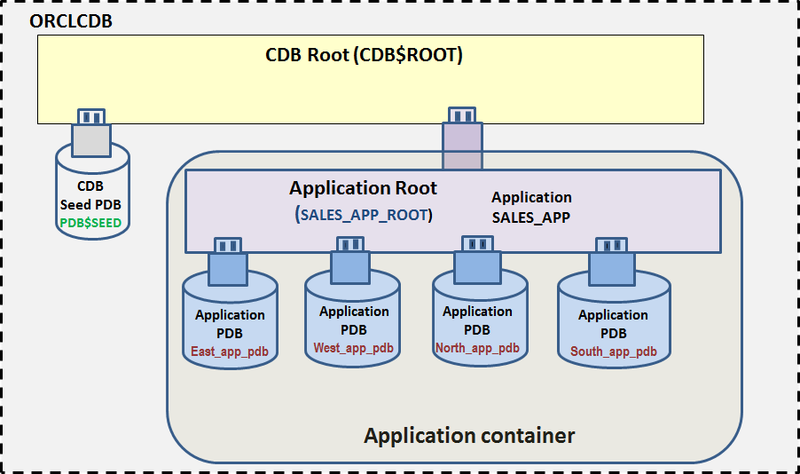 Subsequently, within the application container sales_app_root, we will create the application PDBs east_app_pdb, west_app_pdb, north_app_pdb and south_app_pdb from the existing regular PDBs east_pdb, west_pdb, north_pdb and south_pdb respectively so that they can share common application objects stored in the application root sales_app_root. Clone one of the PDBs; say, east_pdb, as application root sales_app_root. Verify that the new application root sales_app_root contains all of the database objects used by the application. With sales_app_root as the current container, start installation of the sales application sales_appby issuing an ALTER PLUGGABLE DATABASE ... BEGIN INSTALL statement. Run the procedure DBMS_PDB.SET_USER_EXPLICIT to associate the user sales_app_user with the application sales_app as an application common user. Run the DBMS_PDB.SET_DATA_LINKED procedure to associate table sales_app_user.products with the application sales_app as a data-linked application common table. Run the DBMS_PDB.SET_METADATA_LINKED procedure to associate table sales_app_user.customers with the application sales_app as a metadata-linked application common table. Run the DBMS_PDB.SET_EXT_DATA_LINKED procedure to associate table sales_app_user.zip_codes with the application sales_app as an extended data-linked application common table. End the application installation operation by issuing an ALTER PLUGGABLE DATABASE ... END INSTALL statement. In the application root sales_app_root, clone existing regular PDBs east_pdb, west_pdb, north_pdb and south_pdb as application PDBs east_app_pdb, west_app_pdb, north_app_pdb and south_app_pdbb, respectively. Violations will be reported during the opening of application PDBs. Switch to each of the application PDBs as a user with the required privileges and run the pdb_to_apppdb.sql script in the ORACLE_HOME/rdbms/admin directory. Optionally, drop source regular PDBs east_pdb, west_pdb, north_pdb and south_pdb. Check that at present there are four regular PDBs in CDB orclcdb. Clone one of the PDBs, say, east_pdb, as application root sales_app_root. The application user sales_app_user (a local user in source regular PDB east_pdb) has been marked as COMMON in sales_app_root. Since the user sales_app_user is not associated with any application yet, DDL operation can be performed on it even from outside an application action although it has been marked as COMMON. The SHARING attribute of application tables remains NONE as in source regular PDB east_pdb. Also, since application tables are not yet associated with any application, a DDL operation can be performed on them even from outside an application action. It can be seen that currently there is only an implicit application installed in the application container sales_app_root. With sales_app_root as the current container, start installation of the sales application sales_app by issuing an ALTER PLUGGABLE DATABASE ... BEGIN INSTALL statement. Run the procedure DBMS_PDB.SET_USER_EXPLICIT to associate user sales_app_user with the application sales_app as an application common user. Run the DBMS_PDB.SET_DATA_LINKED procedure to associate the table sales_app_user.products with the application sales_app as a data-linked application common table. Now that the user sales_app_user and the application table sales_app_user.customers have been associated with the application sales_app, it is not possible to perform a DDL on them from outside an application install / upgrade / patch operation. In the application root sales_app_root, clone the existing regular PDBs east_pdb, west_pdb, north_pdb and south_pdb as application PDBs east_app_pdb, west_app_pdb, north_app_pdb and south_app_pdbrespectively. Note that currently no application PDBs are associated with sales_app_root. Clone regular PDB west_pdb as application PDB west_app_pdb in the application root sales_app_root. Violations will be reported during opening of the application PDB. Warning: PDB altered with errors. Switch to the application PDB west_app_pdb as a user with the required privileges and run the pdb_to_apppdb.sql script in the ORACLE_HOME/rdbms/admin directory. Optionally, drop source regular PDB west_pdb. Similarly clone rest of the existing regular PDBs east_pdb, north_pdb and south_pdb as application PD's east_app_pdb, north_app_pdb and south_app_pdb respectively. Check that all four regular PDBs have been converted to application PDBs and are in sync with application sales_app version 1.0. Thus, we have successfully migrated four regular PDBs (east_pdb, west_pdb, north_pdb and south_pdb) running the same sales application to an application container sales_app_root as application PDBs (east_app_pdb, west_app_pdb, north_app _pdb and south_app _pdb), thereby enabling them to share application objects and be administered easily as one. Anju Garg is an Oracle Ace with over 14 years of experience in IT Industry in various roles. Since 2010, she has been involved in teaching and has trained more than a hundred DBAs from across the world in various core DBA technologies like RAC, Data guard, Performance Tuning, SQL statement tuning, Database Administration etc.